Electron tomography is a well-known technique providing a 3D characterization of the morphology and chemical composition of nanoparticles. However, several reasons hamper the acquisition of tilt series with a large number of projection images, which deteriorate the quality of the 3D reconstruction. Here, an inpainting method that is based on sinogram interpolation is proposed, which enables one to reduce artifacts in the reconstruction related to a limited tilt series of projection images. 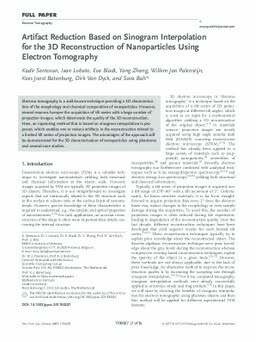 The advantages of the approach will be demonstrated for the 3D characterization of nanoparticles using phantoms and several case studies.